Of course we offer one of the best LA nightclub guest list services around. However, some people require something a bit more special. Our VIP table booking service covers this exact requirement. We only work with what we believe to be the best night spots in LA. We do not, nor ever will, book tables at nightclubs which we feel do not offer our clients the service that they deserve. BottleMenuService provides the ability to book tables with bottle service as well as sign up for guest lists at the most exclusive Hollywood night spots and nightlife in LA. No more calling Hollywood clubs to book tables. No more endless online searching for best person/s to contact to book tables at the most popular and or newest LA hot spots. Never again deal with shady club promoters; wheeling and dealing you for hours and charging you more than you have to pay for bottle service. BottleMenuService is how and where-to book tables at the best and most exclusive clubs in LA. Get a taste of the VIP lifestyle. Make a VIP Bottle and Table Reservations for the Ultimate Experience; which includes your own private / VIP area. Whatever the occasion: bachelorette, birthday, or just a fun night out. Party like a pro and get the VIP treatment with Bottle Service. We make sure you get the best table reservation possible, hassle-free entry and star treatment from start to finish. So treat yourself today and make a reservation. Please fill out your details on the populated form below. Plus, you can also give us a call at (310) 749-9029 to book tables. Want to skip the lines and cover charges? Investing in VIP Bottle Service pays off immediately in the form of a “fast-pass” to your own private party. The luxury will continue throughout the night with unparalleled VIP service and benefits like status and comfort, the two greatest commodities in any nightlife venue. Bottle Service is the perfect way to celebrate or just enjoy a night out on the town. 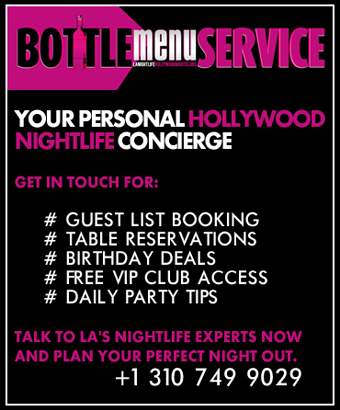 You are one click away from getting bottle service deals to book tables at the best exclusive LA night spots!! When you book bottle service and VIP table service reservations with our staff, you are treated much better than if you did it on your own or even with the club directly. You are the VIP of all VIP’s at the club. Other people who book tables with bottle service will wait in a line, get bumped, get a bad table or be told they need to spend more… even those who book tables with the club directly. What does bottle service include and what are costs to book tables? Almost all clubs these days have VIP tables arranged throughout the club. When you get VIP table service at a club you are paying the club a premium for bottles, mixers, and a reserved table area. Mixers are pretty standard across most clubs; cranberry juice, orange juice, tonic water, limes, soda, and more. If you want energy drinks or bottled water you will have to pay extra (but that amount is counted towards your minimum). In addition to bringing out the bottles, bottle girls also serve your drinks, pour shots, refill your mixers, remove empty glasses, etc. VIP table service has a minimum spend; that is, the amount you need to spend on alcohol. The table minimums that you are quoted never include tax, tip and table [or entertainment] fees; which you can estimate to be around 32%. Elegance truly becomes unruly with top notch VIP special events services. Start your night by surpassing bystanders as you enjoy VIP entry. Then, take your seats at an exclusive VIP table. This is where you will enjoy the best of bottle service VIP at the most in demand real estate in the club. Simply fill out our short form. And, in under one minute, you’re done! We do the rest. BottleMenuService provides a simple and transparent process that will upgrade your night with the tap of a button. Complete resource for Hollywood nightclubs and best LA club events happening in 2018. BottleMenuService invites you to experience the most exclusive VIP celebrity attracting party places. Find bottle service deals at current top Hollywood clubs, bars, lounges, events and the most popular LA night spots. 24/7 phone access for advance or last minute bookings at ALL the top Hollywood clubs. Our connections will ensure you get a better located table in the club. If you’re not happy, call us on the night; and we'll fix it ASAP. Table quotes and full drinks price lists available on request. Recommendations on where the best club will be each night of the week. Regular updates on the newest club openings, upcoming events, and big name DJ and celebrity appearances. Complimentary shots, and even bottle/s, at certain clubs brought out to your table.